Our students of Highlands School Barcelona has been studying the Romanesque style in Architecture, Sculpture and Painting. 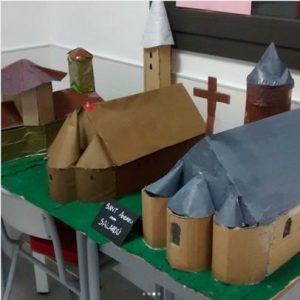 They decided to put “hands on history” and (re)create some romanesque churches located in the Aran Valley, Alta Ribagorça and Berguedà. They made the floor plans, distinguishing between central naves and side naves, as well as the apse, apsidioles and ambulatory. They also had to create towers or domes by calculating the proportions of the church. The girls of 4th of ESO experimented with Francisco de Goya’s paintings. They recreated them by keeping the same characters but by using different techniques. After proving how artistic they are, they taught the rest of the class about the significance, myths and stories of each painting.